Winter Trends: Velvet | Petite Plus, Meow! Here we are: the last Thursday of December …. the LAST THURSDAY OF 2016!!! All month long PPMeow! teamed-up with StyleCassentials to bring you another collaboration featuring some of the Winter Trends for 2016 Holiday Season!!! To wrap up our December long series we’re putting our own spin on wearing VELVET! As luxurious as velvet it… I’ve stayed away from it so far, as I just haven’t found a piece that I liked myself in. The velvet slip dress was the “IT” item this Fall. So I kept an eye out for one that might work for me and my bod. I ordered one from ASOS way back at the beginning of this month – but it has never bothered to arrive. This dress has a fantastic hemline, with a bit of ruching in the mid-section to help mask any tummy troubles from that 2nd helping of dinner or in my case a cheese fondu party. I didn’t feel comfortable having the ta-tas all out-and-about in this brown/pink curve-hugging velvety frock for holiday house parties among married and coupled-off friends. Sooooooo I wore a thin long-sleeved band tee underneath it + sheer hosiery + mid-calf length black boots … and BAM! 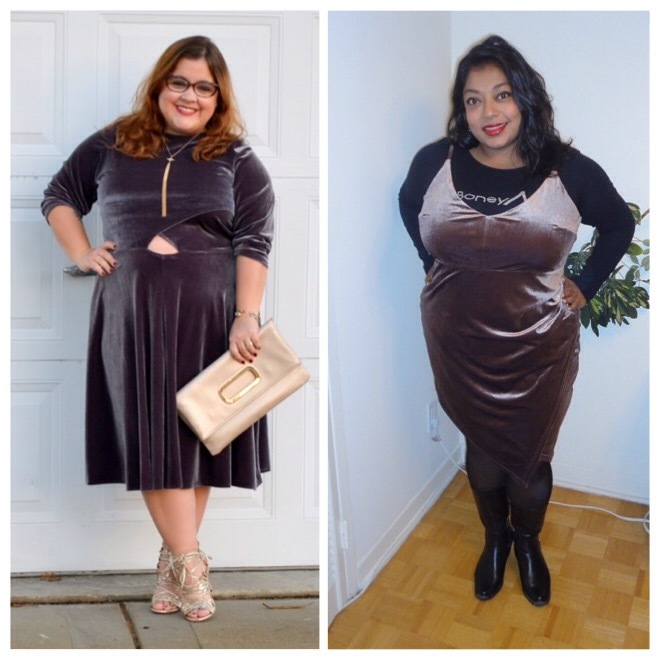 I’ve styled this velvet dress in 3 different ways throughout December …. which way do you like it best? Cassie is wearing this high neck, long-sleeved grey velvet frock….with a little cutout. Her gold accessories, purse and strappy shoes really add to her overall glamorous look! Head over to Style Cassentials for all the details on Cassie’s winter trend of velvet in her outfit. Or her Instagram here. Or visit her Facebook page here. There you have it!!! The entire month of December with a featured Winter Trend!!! Winter is coming and this year I have some problem to my waist. I don’t wear any trendy winter dress for my fatty body. In this situation Should I use waist cincher to under my clothes? I mean, I use waist cincher for my under garment dress. This is right or wrong for me? Please tell me what should I do?